Football Field is a special Ground Forces map, not available in normal battles. The map was used in the “A fiery ball” tank football event, in celebration of the 2018 FIFA World Cup, being held in Russia at the time of the event. 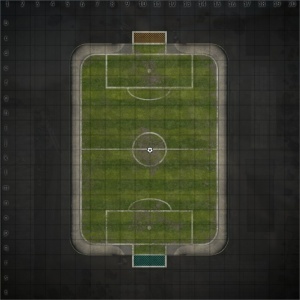 The main feature of the map is a football field, inside a large abandoned industrial building. Rectangular holes in the wall, at each end of the building, act as goals, with a metal cage protruding out each end of the building acting as the net. All round the edge of the field there is a curved ramp leading up the wall. The field has standard football pitch markings, while coloured War Thunder banners (matching the colours of each team in the event) hang from the roof beams and walls. The War Thunder and Gaijin Entertainment logos are also painted on the walls at various points. The area immediately around the arena is quite densely populated with other buildings and cranes, as well as lightning towers and other scenery such as shipping containers and barrels, visible from inside the goals and out of the collapsed roof of the arena. 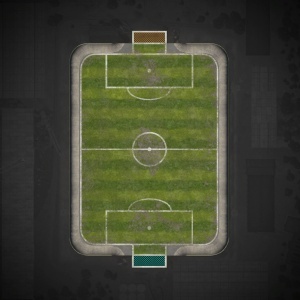 The full location is 8km x 8km (to provide scenery outside the arena), but players can only play on the football pitch which is 240m long by 180m wide. The map is completely fictional, however uses assets from the Abandoned Factory and Port Novorossiysk maps, giving it a Russian feel. Two teams of three players face each other in a game of football, using modified M551 Sheridans, which can fire their main gun in order to be propelled in a direction. The teams spawn at either end of the pitch and must score by knocking a ball (which spawns in the centre of the pitch), into the enemy team's goal. One player (from the team who last let a goal in) will spawn next to the ball and be able to reach it first, and pass it to a team mate. When the ball enters a goal it explodes and the person who knocked it in is awarded a goal. Once a goal is scored it is added to the counter at the top of the screen and the game resets. After 5 minutes half time is called and the game will reset. After another 5 minutes the game will end and the team with the most points will win. The jump ability will carry the player in whatever direction their gun is pointing (including up and sideways), use this to your advantage. When you spawn next to the ball it is usually best to pass it to the friendly player in front of you. Starting near the ball is an advantage, by the time you've got turned round and facing the enemy goal in order to try and knock it in yourself, the enemy tanks will usually have already almost reached the ball, wasting your advantage. This page was last edited on 28 January 2019, at 01:39.